Injured Portland Trail Blazers center Festus Ezeli is working on a letter of gratitude for the family of his cadaver donor. He hopes to meet the family and honor them by playing in the NBA again. Ezeli never played in his first season with the Blazers. He had cadaver ligament replacement surgery on his left knee on March 7. The 6-foot-11, 265-pounder has not been told who the donor was, but through his doctor he can give a letter to the family, who can then decide whether they want to meet him. Ezeli is hopeful they will want to after he gives the letter to his doctor during a follow-up appointment on May 7. “I’m actually working on my letter right now, because I really do want to meet them,” Ezeli told The Undefeated this past week. “I have no clue who I got it from. It had to be a big person. There are so many different requirements to getting the cadaver. It was kind of crazy. It had to be a big person, about my weight and size, so that I could handle my weight as I play basketball. The person had to be young, so it’s not brittle. And there’s all these different restrictions. Three years ago, Ezeli bought his mother, Patricia, a home in a suburb of Sacramento, California. Now, the former Golden State Warrior is spending a lot of time on the living room floor, watching NBA playoff games on a 65-inch television. During that time, his left knee is inside a continuous passive motion (CPM) machine designed to aid recovery after joint surgery. Patricia Ezeli takes her son to rehabilitation that is projected to last one year. She postponed a trip to her native Nigeria to aid her son, and on Monday she made him food from her native land for dinner. There is a Jesus mini statue, courtesy of his mother, staring at the big man as he watches games. “He wants to help his teammates, but he can’t. That makes him really sad,” Patricia Ezeli said. Ezeli has been happy and sad during his young NBA career, which includes a 2015 championship but also has been riddled with knee problems. The Warriors selected the former Vanderbilt star with the 30th overall pick of the 2012 draft. Ezeli played in all but four regular-season games as a rookie but missed the entire 2013-14 season after right knee surgery. He appeared in 46 regular-season games in each of the past two seasons for Golden State. Ezeli played a key role in the 2015 Finals, filling in for an injured Andrew Bogut to help the Warriors win the title. 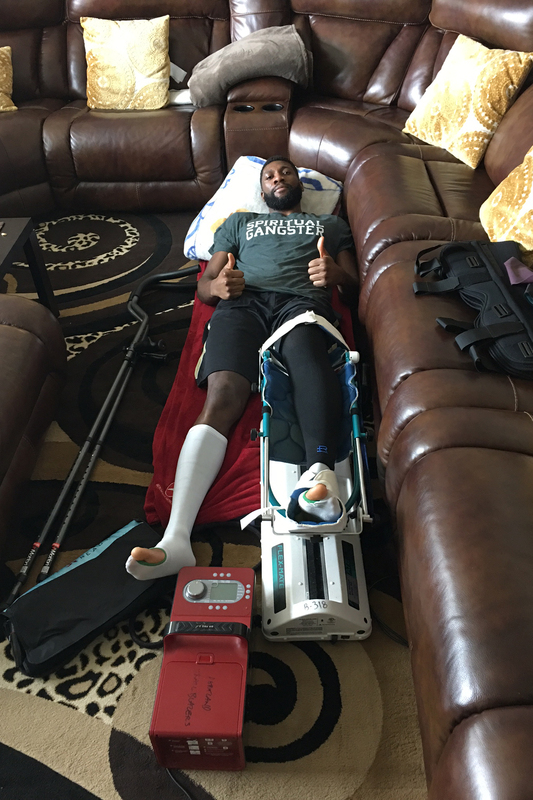 On Feb. 8, 2016, Ezeli had arthroscopic surgery to clean out debris from his left knee. After missing 31 games, he returned just days before the NBA playoffs on April 3 against the Trail Blazers. Ezeli quietly fought his way through postsurgery knee pain in the 2016 playoffs as the Warriors blew a 3-1 Finals series lead to the eventual champion Cleveland Cavaliers. Ezeli’s most talked-about moment of the Finals was when he went back into the game in the fourth quarter of the deciding Game 7. The Warriors were up 87-83 after a 7-0 run with 5:24 remaining. A defensive switch on Ezeli’s first play after returning matched him up with Cavaliers star LeBron James on the perimeter. James drew a shooting foul on Ezeli and made three momentum-changing free throws. James also nailed a 3-pointer over Ezeli on the Cavs’ next possession to take an 89-87 lead with 4:53 to play. That was the last NBA game for Ezeli, who finished scoreless with one rebound in 11 minutes. Ezeli doesn’t regret playing in the playoffs last season despite not being fully recovered. 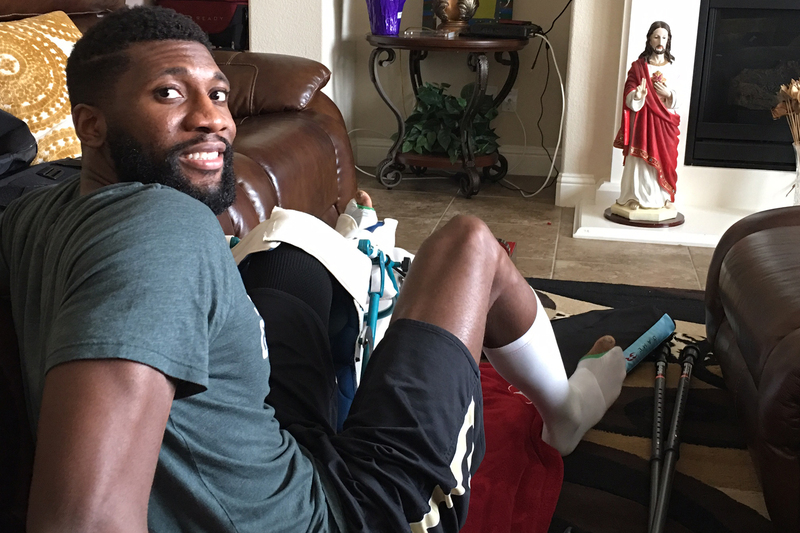 Festus Ezeli works out his knee while at home. Ezeli said he passed a physical before signing a two-year, $15.2 million deal with the Blazers last offseason after averaging career highs of 7.0 points, 5.6 rebounds and 1.1 blocks in 16.7 minutes per game during the 2015-16 season. Ezeli said he “felt good” entering training camp and believed he could give the Blazers a much-needed rim protector, rebounder and post scorer. Blazers coach Terry Stotts was excited about what he saw during a scrimmage. By the third day of practice, Ezeli said he felt debilitating pain in his left knee. He said it was so bad he struggled to walk to his car and put on his shoes. Ezeli said he was diagnosed with a defect in the cartilage in his left knee that could grow over time. He said he talked to five doctors who suggested that if he didn’t have knee surgery he risked suffering a career-ending injury. The 27-year-old decided to have “aggressive surgery,” selecting the cadaver ligament replacement option. There were questions in the Blazers organization about whether Ezeli knew he was hurt before signing his contract, sources said. Ezeli said he was hurt in training camp and he wasn’t trying to trick the Blazers. The Ezeli injury news was disappointing to the Blazers. “He practiced one day. He has been dealing with the injuries all year and waiting to have the operation,” Stotts said. “First of all, deciding whether to have the procedure or not was a difficult decision. Now he has a long road ahead of him with rehab. He knows how to play. Obviously, with what he did last year and the glimpse of what I saw in practice, it was going to be encouraging for him and us. It was very frustrating for him. Dr. Brian Cole, an orthopedic surgeon who provides sports medicine cartilage restoration in Chicago, first recommended the cadaver ligament replacement surgery to Ezeli. Three other doctors, including Dr. James Andrews, seconded Cole’s recommendation, according to Ezeli. Ezeli said he has a friend who is a professional tennis player who had success with the surgery, and he also watched several informative videos. The surgery was to be performed by Dr. Robert LaPrade at the Steadman Clinic in Vail, Colorado, once a cadaver ligament was found. Ezeli said he was placed on the donor list in December 2016. He got a call from the clinic that they found a match at the beginning of March. The Blazers announced March 4 that Ezeli was to have season-ending left knee surgery that took place three days later. The gift from the unknown donor truly touched him. The Blazers have a $7.73 million option on Ezeli for next season with $1 million guaranteed and shopped him before this season’s trade deadline, according to ESPN.com’s Marc Stein. While Ezeli said the Blazers have been supportive, it would be surprising for the franchise to exercise that option considering how late he would return and the unknown on how he would perform. The Blazers also have budding star Jusuf Nurkic on the roster at center, as well as young reserves Noah Vonleh and Meyers Leonard. Festus Ezeli after working out his knee at home. Even so, Ezeli yearns to make his NBA return in a Blazers uniform. Ezeli’s left knee is swollen; he has rehab five days per week and is working on his range of motion. His mom is cooking healthy food for him to make sure he doesn’t put weight on his svelte frame. Ezeli is watching a lot of old NBA Finals games on YouTube in his spare time and playoff basketball while lying on the ground connected to the CPM machine. He said he was “proud” of how the Blazers competed and showed “heart” against the top-seeded Warriors in a competitive Game 1 loss Sunday. He is using crutches and his travel is limited, which is why he isn’t attending the Blazers-Warriors series. Ezeli has been dreaming about what it would be like when he returns to the NBA. It’s those dreams that have made him more confident that he will be back and healthy next time. And another dream of his is that the donor’s family will be there to witness it all.